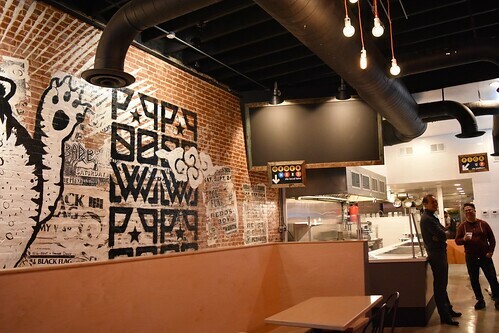 Pow Pow, a new fast casual restaurant opening soon at 1253 H Street, comes to us via familiar faces Shaun Sharkey and Stephen Cheung, who have big plans for the space. Sharkey is well known for his local music and dj activity and Cheung owns Capitol Hill farm to table Italian restaurant Lavagna. 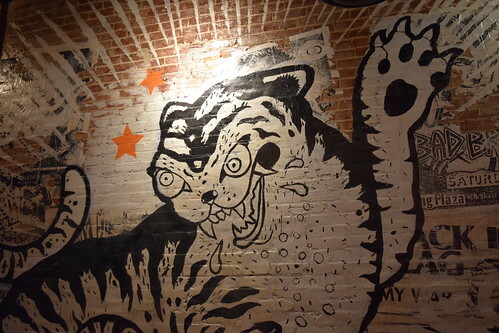 A large tiger mural by artist Keyhan Solo greets visitors upon entry. 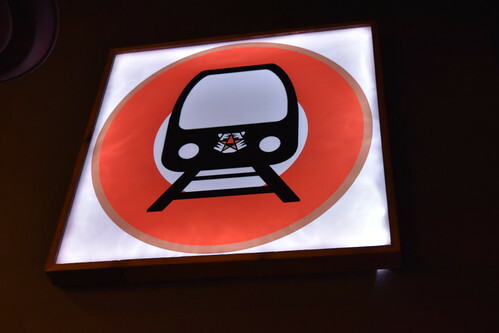 The space, which was partly designed by Sharkey, has a subway theme you’ll notice reflected in signs throughout the restaurant. 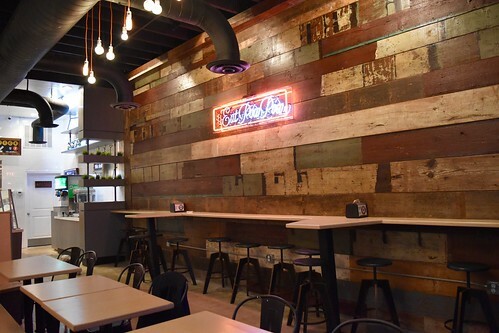 Reclaimed wood from a Virginia barn covers one wall. 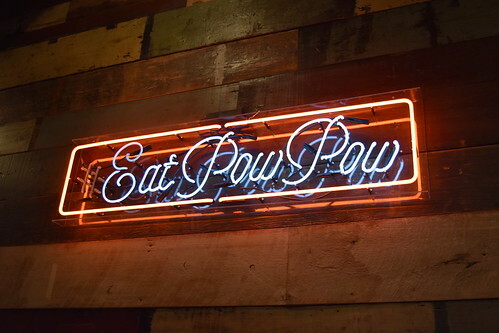 Pow Pow will serve food inspired by Chinese, Korean, and Japanese cuisine. They’ll use ingredients sourced from local farms and producers when feasible. The menu consists of rice and salad bowls, as well as jumbo-sized egg rolls. If this sounds a bit like the build your own bowls you might find at a well-known Asian inspired chain, think again. Pow Pow is actually built around the opposite idea. The menu is chef driven, with the ingredients for each item carefully selected. Customers should still feel free to customize their orders. 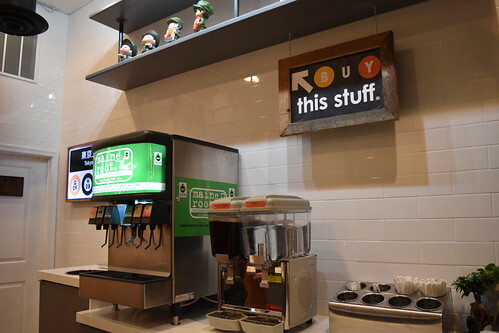 You won’t find bib bim bap on the menu, instead they offer bowls with music inspired names like the Fugazi Osbourne, the Wu-Banger, and the K-Town. John Yamashita of Sticky Rice (1224 H Street) helped create the menu. Rice bowls are served on a mix of black rice, white rice, and quinoa. Looking for something slightly lighter? Order your bowl served on a bed of mixed greens instead. Pow Pow also serves giant egg rolls (about 10”). Look for fillings like pork and pineapple, steak and cheese, and an offering with vegan mock chicken. Those with a junk food craving can dig into the kimchi or bar-b-q fries. For dessert you can get a more modestly sized egg roll filled with Nutella and banana. Sharkey’s a vegetarian, so he’s sensitive to the needs of vegetarian and vegan diners, as well as those who avoid gluten. Pow Pow won’t serve alcohol. Instead you can enjoy a Maine Root fountain soda. They come in flavors like blueberry, ginger brew, orange, and Mexican cola. Those looking for something less sweet can opt for one of the home brewed iced tea blends. 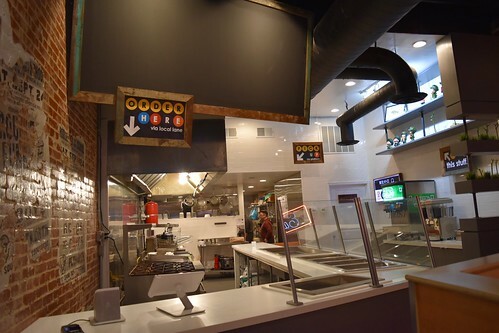 Pow Pow will occupy only the first floor, leasing the second floor to their neighbor Sol Mexican Grill (1251 H Street). That leaves Pow Pow with seating for around 30 patrons. They don’t have highchairs, but are working on some kid friendly menu options. Pow Pow will be open seven days a week. 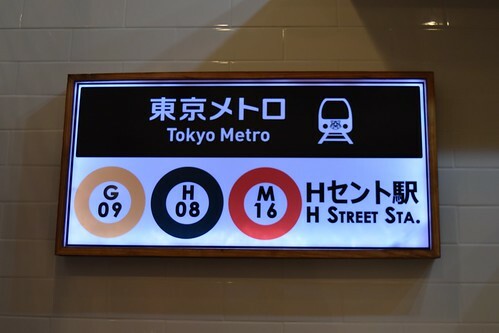 Initially they plan to open for dinner only, but they will add lunch service soon. Look for late night service on Fridays and Saturdays. As an interesting sidenote, Sharkey is not the first in his family to run a business along the H Street Corridor. His paternal grandfather operated a coffee shop on Benning Road just beyond the Starburst prior to the riots, and his maternal grandparents had the headquarters for their construction company nearby. 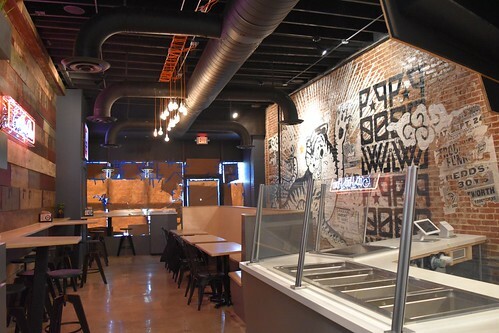 Pow Pow will hold its grand opening this Saturday from 5pm to 10pm with a ceremonial dragon dance and a dj for the celebration. I guess this is like Chipotle's Shophouse. We'll bring our own highchairs! Thanks for making that a standard part of the announcement/reviews. You are the best. Sharky's revenge on not getting the Maketto space! Let's see if the food is any good, after all of this drama.